Edit - Don't forget the day is here to redeem this coupon today! Be sure to dig yours out and get this BOGO in-store! Readers have reported finding the Maple Cheerios at Walmart, Sobeys and other stores. Where did you find yours? Let us know on our Facebook Page. Free Fridays are back! Save.ca has brought back Free Friday coupons! 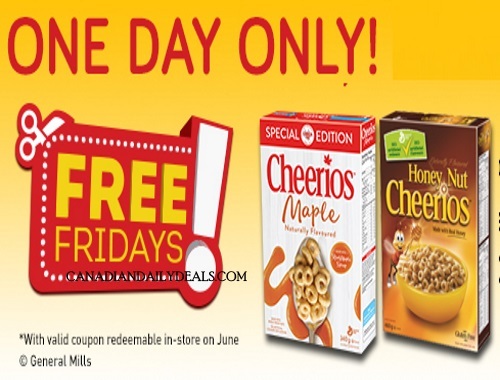 Get a Free Maple Cheerios cereal (340g) with the purchase of any Cheerios cereal (390-1300g). The coupon is valid on June 30, 2017 only. You can get a second set of these coupons here too.